Steve Matthes: Weege! I’m excited for the upcoming MXDN at Redbud for a number of reasons, but maybe number one is that you’ll get to go! You’ve gotta be pumped up on a Barry Carsten-winning KROC kind of level, right? Tell me you are going…please? I heard you’re hosting the MXDN Legends fundraiser on Friday night as well, which is awesome for you. I hope I get to sit at Tim Ferry’s table, by the way. By the way, the actual American team I’ve heard is going to be Tomac, Plessinger and Barcia, and really, that’s an obvious choice, right? Jason Weigandt: Yes, I’m going, and even better, I negotiated a free place to stay courtesy of former Racer X marketing guru Jordan Roberts, who lives ten minutes from the track. Do you know how much money I just saved? This is like Barry winning KROC and then showering me with Suzuki contingency bucks. It’s raining yellow! As far as the team, yes, those are obvious choices, but is that lineup based on actual hard info or just a guess based on today’s point standings? It’s crazy to watch Team USA simply pick the top riders based on the standings instead of having to patch things together with 250 riders on 450s. We’ve tried it, the riders gave it an effort, but ultimately Team USA hasn’t won since 2011. You know who was on that team? Ryan Villopoto and Ryan Dungey. That’s ridiculous firepower. Just ask RV about it, he’ll be glad to tell you. By the way, I’ve got no problems with an AP/ET/JB team, but it’s a long way until October. What if someone gets hurt? Matthes: I got the text “Team USA is set” and those names from someone I think would know. Tried to confirm it with someone else and hadn’t heard back. But, I mean, really—this is an obvious team so I’m not surprised. Oh, trust me, RV is WELL AWARE that USA hasn’t won since he rode for them. He tells me about it every year around the race, along with some four-letter words regarding however the current team USA just performed. Anyway, injuries do happen and it could strike any of these three, I suppose. I would probably go with Jason Anderson if someone on 450 gets hurt if he shows that he’s up to speed once he does come back (which I’m sure he will). I mean, seriously, I don’t know what Blake Baggett’s deal is this summer, but we’ve seen enough motos now to know this this isn’t a freak deal, he’s just not riding as well as we all think he can. And if AP gets hurt, well, you know who’s up next. I think we ALL KNOW WHO’S NEXT. And as a past member of Puerto Rico and USA, we KNOW he’s ready. WOOT WOOT! ALL ABOARD THE TROLL TRAIN! 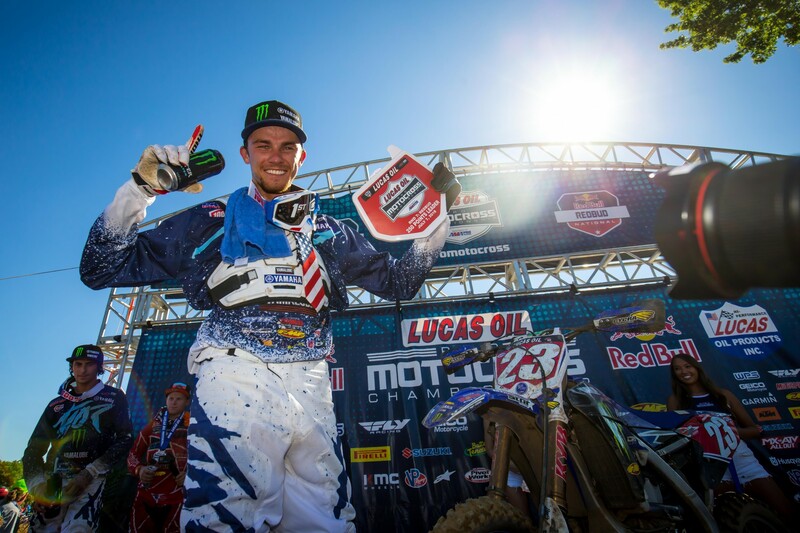 And, by the way, as I’ve been saying…Team USA wins MXDN this year. Stamp that. Seriously, look at the USGPs we’ve had over here…like RJ Hampshire winning in Jacksonville last year. Where is he this summer in the 250 Class? He’s good but not winning races. Look at the Glen Helen USGPs; just red, white, and blue everywhere. Over here, on a USA track the guys know well, without travel and other logistic issues, USA wins. Sorry, not sorry. Unless of course, injuries hit hard. And by the way, Go CANADA! Weigandt: RV is gonna RV. By the way, you know Ryan will be at RedBud bashing Coors Lights all weekend, so you’d better hope Team USA wins or the four-letter stampede coming from his mouth will smash everything in earshot. Look, I’ve heard you’re stamping this win for Team USA but do not forget that the new superpower of MXdN competition, France, is not playing an away game. Unless France is insane, they’re gonna put Marvin Musquin and Dylan Ferrandis on the squad. Those two just raced RedBud just like Tomac, Plessinger, and Barcia. And they’re really good! American fans will be happy to take their chances with Tomac vs. Musquin and Plessinger vs. Ferrandis, but there isn’t a giant gap there—Marvin and Dylan are familiar with this track, too. Maybe Tomac and Plessinger are slightly better, but it’s close enough where one mistake or crash can tip this completely in France’s direction. The only thing I’m worried about is how the fans will treat Marvin. He’s been getting some grief ever since the “Foxborough incident” and our guy Kyle Scott caught a stars-and-stripes-clad fan showing Marv who is number one last weekend. 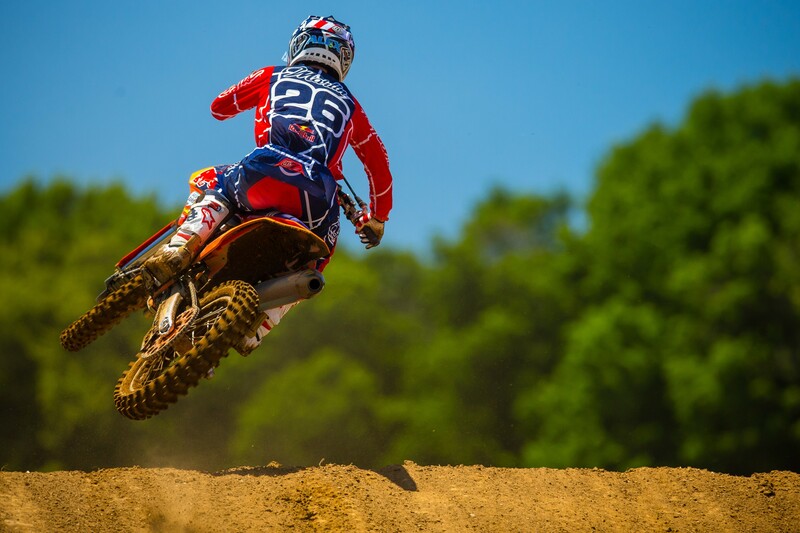 If Marvin leads Team France to victory at RedBud there’s going to be rioting in the pits. So, with two American-based riders on the team, France has kind’ a home-track deal going, too. But kinda not, because the fans will be hating. That’s a huge factor. Someone get Marvin some extra security! Matthes: Yeah, poor Marv…in my opinion he shouldn’t have to put up with that, but I suppose he did saw off Tomac’s front wheel for the win, so every time he feels anger, just look at his bank balance and know that he cashed the bonus check. So you have to do the time for the crime? I don’t know, I just tried to rhyme there for some reason. Look, these are all valid points on France, Weege. Yeah, they could win, but they’re not going to. The Americans have shown that they come through when this race is held here (although I believe USA was trailing going into the third moto at Thunder Valley), and they’re going to do it again. Also, even on foreign soil, Team USA hasn’t lost many of these races WHEN they send their best three, and it’s not going to happen on home soil. I feel strongly about this. Of course, it could happen, but I highly doubt it. Now, having said that, Jeffrey Herlings could win both his motos easily with Marv winning the other and USA could get shut out of individual glory, but they’ll take back the trophy. And then there is the start. The MXGP guys like the start to be heavily favored towards the riders that qualify the best and they love the hairpin first turn. So the current Redbud start will not do so it will be moved over to where the pro pits are now and today’s second turn (a hairpin) will become the first turn for MXoN. Now, here’s the part where I say that its simply ridiculous to have a first turn that favors the inside so much and then draw random clothespins for the starting gates for Saturday qualifiers. I mean, I know that if I’m a country that’s not one of the big five and spend tens of thousands of dollars to go to the race and then see my chances of making the A main evaporate with a 39th place clothespin drawn by a Monster girl, I’d be the opposite of stoked. But I’ll save you this rant for before the race…oh wait, sorry, just did it. Simply ridiculous. You Americans don’t pay attention to this kind of stuff because even with terrible gate picks on Saturday, your country is going to qualify. But as a Canadian whose country is on the verge of not making the A final some years, THIS MATTERS AND IS SO BEYOND SILLY THAT IT’S CLOTHESPINS AND NOT THE PREVIOUS YEAR’S FINISH that determine gate selection. Okay, breathe, I’m good now. Weigandt: I’m with you on the clothespins deal; that’s simply too random. Plus, if you base Saturday’s gate selections on last year’s results, it provides a little extra motivation for a team that’s down and out. I can tell you that American fans DO NOT CARE AT ALL about finishing on the podium at this race. For Canada, a podium would be amazing. For Australia, finally getting one after decades of trying was huge. For the Brits, they went like 20 years before finally getting one again. For American fans, though, the moment it’s clear Team USA is going to finish second or worse, it’s time to turn, walk away, shut the laptop, and turn off the TV. Winning is all that matters. But if last year’s results mattered a little, maybe that would be something extra to watch when hope is bleak by moto three? The best starts are the fairest starts, but it’s obvious why they build the “favor the inside” starts in the GPs. It makes the Saturday qualifying races much more important. Did you know that Aaron Plessinger’s average qualifying time this year in Lucas Oil Pro Motocross is 9.3? No one does, and no one cares, because Aaron’s day isn’t ruined just because he got the ninth gate pick. He might not even care about his qualifying time, and we know very many other successful riders, like Chad Reed and Ken Roczen, do not care about qualifying times. Well, that’s not good when you’re running a two-day event. With the inside-favored gate, up goes the consequences of a bad qualifying race on Saturday. Now, Saturday matters! Can you feel the electricity? Let’s just have some fun here. Let’s say things go wonky for the Americans and some combo of Tomac/Plessinger/Barcia can’t go. Let’s make some crazy team picks that would make for an epic B-team adventure. For starters: A-Mart. Yes, I know it’s hard for people to picture Alex Martin as the 2018 250 National Motocross Champion, and it would also be difficult for people to picture Alex as one of the three picks for Team USA. Wait, what’s that? He’s already been on Team USA before? And Team Puerto Rico? Wow. What if everything blows up for Team USA and we get Anderson back from injury, A-Mart on a 450, and then…wait, wait, that’s Zach Osborne’s music! And Zacho makes his return from shoulder surgery just in time to save America’s bacon. Come on, this would be fun. Or maybe one of them wads it in practice and DeCoster says, “Is anyone here ready and willing to help Team USA right now?” and Villopoto says, “Hold my beer,” and carries the team on his back. Or Ryan Dungey says, “Hold my recovery drink,” and does that? I want something all-time nuts here. I went to Unadilla in 1987 and watched an ancient Bob Hannah beat Europeans in the mud on a 125. It made no sense, and that’s why it was awesome! Matthes: Oh, here we go with the “Weege helicoptered into Unadilla in 1987 stories” again. In case you’re wondering, I’m 100 percent FINE with Alex Martin going for Team USA. And although AP’s qualifying hasn’t been great, it doesn’t matter that much because if USA draws 38th, he ain’t getting a good start anyway. If the Monster Girl draws four, he is. Anderson and Osborne wanted to do this race so badly, so you have to feel for both guys. Wouldn’t it be insane if they actually got in? What about Benny Bloss? I mean, hey, if Thomas Covington can move to a 450, a bike he had never raced professionally on, for Team USA, then why not Benji? And seriously, I’ve heard about 800 different riders want to/are riding for Puerto Rico so who IS going to put on the red, white, and blue with one-star flag? That team could do some serious damage, right? Weege: Okay, I’ll stop with the Unadilla 1987 stories, but we BOTH need to stop with Team Puerto Rico stories. I’ve heard so many rumors about this team that even Villopoto himself riding for it wouldn’t even be considered that crazy. Maybe it gets so nuts that the FIM finally has to close the loophole that allows ANY American rider to compete on this team? I mean, Osborne used to ride for Team PR and eventually joined the real Team USA, so did A-Mart, and Covington was supposed to last year until Team USA had to draft him into service. In other words, Team Puerto Rico is becoming too legitimate to be considered a non-factor like it’s supposed to be. Remember the Thunder Valley MXoN in 2010, where Kyle Regal was getting podiums for Team PR? I don’t think that’s how it’s supposed to work, but, watch, Puerto Rico is going to be a huge part of this year’s MXoN. Stamp that! A look back at the Pennsylvania Full Gas Sprint Enduro. This week in your sport.